When SRA Home Products installs outdoor rooms at homes in the Warminster and Willow Grove, Pennsylvania area, homeowners are always blown away by the incredible transformation of their outdoor living spaces. We are proud to provide durable, gorgeous outdoor rooms that allow homeowners and their families to enjoy the stunning views of their backyard without being plagued by insects, windblown debris, harmful UV rays, and other annoyances that frequently accompany the great outdoors. Screen rooms –TEMO’s screen rooms are equipped with removable vinyl sashes that protect against outdoor nuisances such as bugs, windblown debris, inclement weather, and UV rays. On a clear day, simply remove the lightweight sashes for maximum views and ventilation through the screens. Sunrooms – With high-performance glass and thermal wall and roof systems, these structures provide exceptional energy efficiency, which in turn can help to maintain a comfortable indoor temperature. 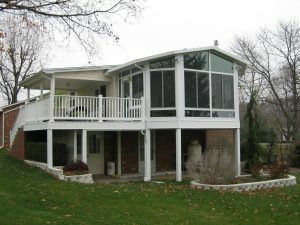 TEMO sunrooms also come in numerous different styles, so you can be sure that there’s something to perfectly match the existing construction of your home. What’s more, when you choose SRA Home Products to provide you with one of TEMO’s exquisite outdoor rooms, you will have the satisfaction of knowing that our factory-trained and -certified employees will handle the installation process from start to finish. Because we never hire subcontractors, we promise that the installation of your outdoor room will be executed in a timely, efficient, and professional manner. In fact, our employees’ hard work and dedication has helped us earn an A+ rating with gold accreditation from the Better Business Bureau, which we work to maintain through every single project. Call SRA Home Products today to learn more about the outdoor rooms we install at homes throughout the Warminster and Willow Grove, PA area, or to begin the installation process at your home. Be sure to ask about the manufacturer’s limited lifetime transferrable warranty on all outdoor rooms we install.